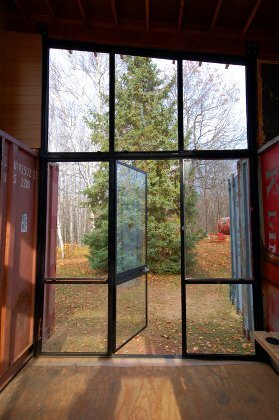 Holyoke Cabin is an excellent example of an elegant, efficient use of shipping containers to create a cozy cabin off the grid. 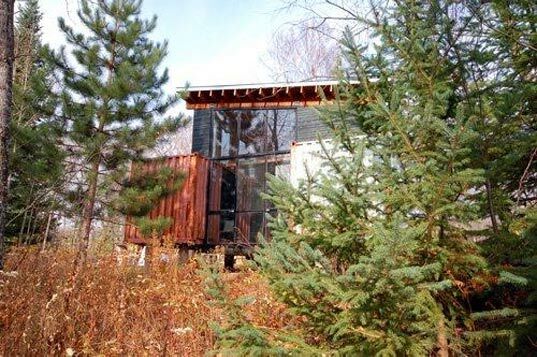 Two used shipping containers, obtained for $800 apiece, serve as the starting point for this quaint prefab residence located outside of Duluth, Minnesota. The elegance of this design lies not in a super polished appearance, but rather the straightforward use of the containers as structure, as well as enclosure. Since shipping containers are relatively structural items to begin with, the idea of using two of them as the basis of the entire building is an excellent use of materials. Only twelve concrete piers were used to connect this building to the ground, minimizing its impact on the site, which is sufficiently remote that the concrete for the footings had to be mixed by hand, and the water hauled up from the nearby creek. The containers are left mostly unpenetrated, which preserves their structural integrity, but a connecting space with numerous large windows provides lots of light to the interior of the cabin. There are many examples of modern houses built using shipping containers where there has been so much added to the structure that it is difficult to tell that it started with a couple of shipping containers. 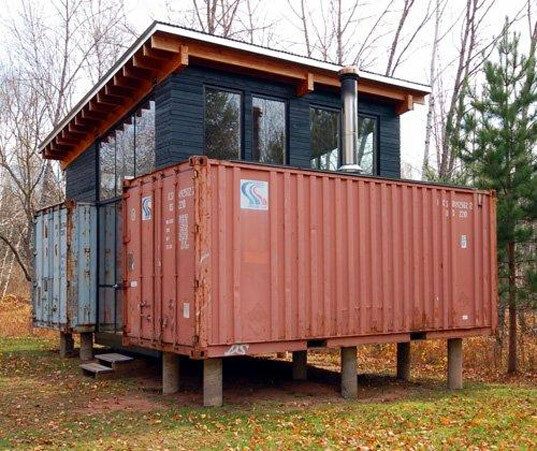 The Holyoke Cabin may not be as sleek as those others, but it is an undeniably wonderful example of the best of shipping container construction. The story of this cabin’s construction shows more about how the structure was built and includes many more pictures taken during construction. Eventually, the owners plan to add a small PV array for 12v lighting and a rainwater catchment with a cistern will provide a gray water system to this off-grid cabin. very clever and artistic use of two containers. it looks great - rather barnlike and set in a wide open space it doesn't appear out of place. the middle space brings the two containers together as if it was always meant to be. i love it! I love it! I agree, it would be great if they would include a floor plan. It works, but it sure as hell ain't elegant... I wish you inhabitat guys would look at structures objectively instead of fawning over every single piece of eco-design, no matter how heinous or poorly implemented it may be. If you're looking for a good rule of thumb, I suggest the following: would you be happy waking up every morning, looking out your window and seeing the structure in question? Beautiful? I don't think so! They should've at least cleaned up the rust, treated it, and painted it over before adding the rest of the structure. That's going to be a problem down the road if not dealt with up front. It would also be nice if Inhabitat could post a floor plan and total square footage on posts like this.